The Andrew James 12 LTR Premium Black Digital Halogen Cooker is a real bargain. It features an affordable price yet comes with all the accessories you’ll ever need from a halogen oven to start cooking right away. And to top that up, the oven has several user-friendly features that enable you to have an easy time using it regardless of your cooking skills. In the following review, I’ll be explaining the features you can expect from this appliance, as well as provide you with any additional information you may need in order to make an informed purchasing decision. One of the great features of the Andrew James 12LTR Premium Halogen Cooker is its hinged lid design. With most halogen cookers, one has to remove the lid and set it aside. For first-time users, this can be a little tricky – and not to mention dangerous as you can easily get burnt or be left with an unusable appliance when you accidentally drop the lid on the floor. The Andrew James 12LTR Premium Halogen Cooker, however, makes it easy and safe for both beginner and experienced cooks. With the hinged lid design, all you have to do is simply lift the lid and it will remain attached to the oven. This allows you to continue with your cooking tasks without any hassles. Another great plus for this Andrew James oven is its digital control panel. This control panel enables you to prepare scrumptious meals worthy of being served at a formal dinner parties even if you’re not a good cook. The control panel comes with automatic buttons that make preparing rice, pizza, cake, and other meals as easy as pressing a button. You don’t even have to set the timer as the oven will automatically turn off when the food is ready. One of the biggest problem facing halogen ovens is food being splattered onto the heating element of the oven during the cooking process. 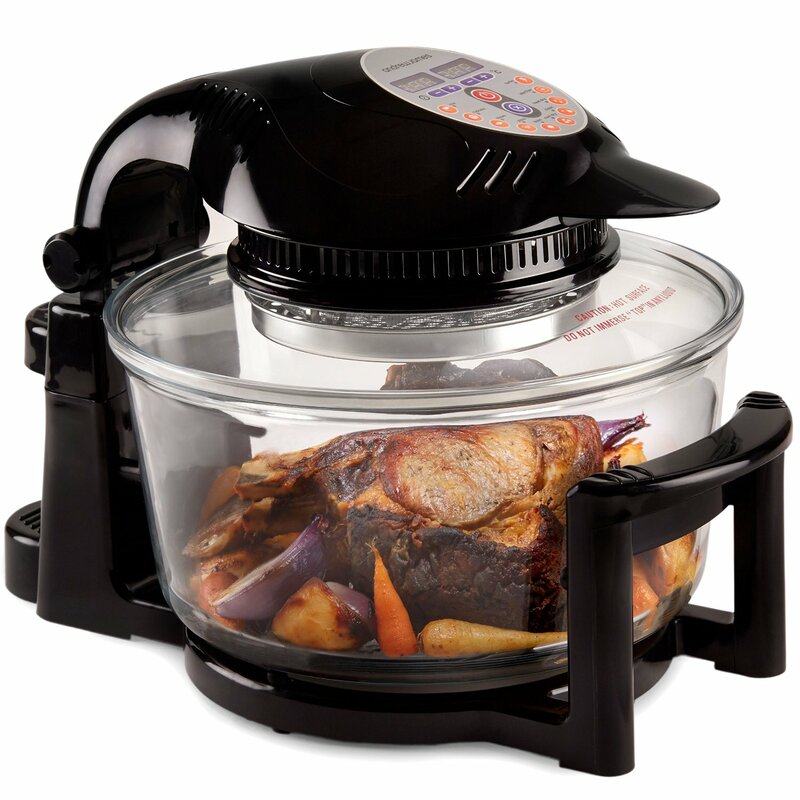 As a result, the lifespan of your halogen oven can decrease significantly in just a short amount of time. Washing the bulb with water is also not a good idea as it can lead to irreparable damage. So, what do all smart cooks do? It may sound completely biased for me to say this, but I think any smart cook should look to invest in the Andrew James brand. This is a manufacturer who has addressed the problem of splattering food by strategically positioning the bulb a good distance away from the glass bowl. In the process, you’ll be minimizing the chances of food splattering onto the bulb and interfering with the functionality of your appliance. The Andrew James 12LTR Premium Halogen Cooker is quite popular on Amazon. It comes highly recommended and features over 600 5-star reviews from satisfied customers. Based on these reviews, it’s clear to see that this oven is a good buy and will continue to attract more happy buyers. The price, features, and accessories of the Andrew James 12LTR Premium Halogen Cooker make it an absolute gem. Regardless of your cooking needs, this oven will serve you excellently and provide you with a great cooking experience.